1 Cut the carrots into large pieces and boil until tender, drain and sieve. 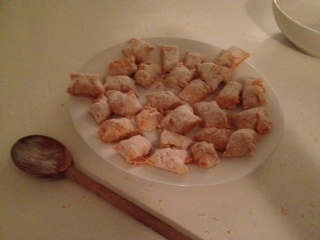 2 Mix the carrots and feta in a large bowl, add spices and stir in the sifted flour. 4 To make the minted cream, melt butter in a frying pan, add spring onion, garlic and cook over medium heat until soft and golden. Add cream and simmer for 3 minutes. Remove from heat and stir through mint. 5 Meanwhile, cook gnocchi in batches in a large saucepan of boiling salt water until they float to the surface. 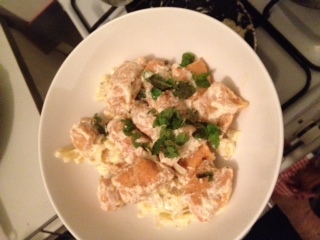 6 Transfer gnocchi to plate, drizzle minted cream and add salt and pepper. Varos felicitaciones,cada día mas experto preparando platos deliciosos.